Nickname(s): "Crossroads of the Great South"
Swainsboro is a city in Emanuel County, Georgia, United States. As of the 2010 census, the city had a population of 7,277. The city is the county seat of Emanuel County. Swainsboro is located near the center of Emanuel County at 32°35'37" North, 82°19'56" West (32.593743, -82.332146). U.S. Route 80 passes through the center of the city, and U.S. Route 1 bypasses it to the west. US 80 leads east 36 miles (58 km) to Statesboro and west 36 miles (58 km) to Dublin, while US 1 leads north 75 miles (121 km) to Augusta and south 106 miles (171 km) to Waycross. Interstate 16 is 14 miles (23 km) south of Swainsboro via US 1. According to the United States Census Bureau, the city has a total area of 12.9 square miles (33.5 km2), of which 12.6 square miles (32.6 km2) is land and 0.35 square miles (0.9 km2), or 2.81%, is water. As of the census of 2000, there were 6,943 people, 2,685 households, and 1,836 families residing in the city. The population density was 560.5 people per square mile (216.4/km²). There were 3,051 housing units at an average density of 246.3 per square mile (95.1/km²). The racial makeup of the city was 48.06% White, 49.68% African American, 0.14% Native American, 0.35% Asian, 0.01% Pacific Islander, 1.22% from other races, and 0.53% from two or more races. 2.03% of the population were Hispanic or Latino of any race. There were 2,685 households out of which 33.2% had children under the age of 18 living with them, 39.0% were married couples living together, 25.7% had a female householder with no husband present, and 31.6% were non-families. 28.4% of all households were made up of individuals and 13.1% had someone living alone who was 65 years of age or older. The average household size was 2.54 and the average family size was 3.10. In the city the population was spread out with 28.9% under the age of 18, 10.2% from 18 to 24, 23.4% from 25 to 44, 21.8% from 45 to 64, and 15.7% who were 65 years of age or older. The median age was 35 years. For every 100 females there were 81.0 males. For every 100 females age 18 and over, there were 73.3 males. The median income for a household in the city was $20,268, and the median income for a family was $26,789. Males had a median income of $26,193 versus $17,425 for females. The per capita income for the city was $14,617. 32.1% of the population and 28.8% of families were below the poverty line. 45.7% of those under the age of 18 and 28.9% of those 65 and older were living below the poverty line. 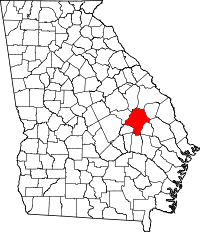 In 1822, Swainsboro was established by the legislature as the seat of Emanuel County. The town was named in recognition of Stephen Swain, the state senator who introduced the bill for the county's creation in 1812. The town's name was changed to "Paris" at its incorporation on February 18, 1854, but three years later reverted to its current name. Early in its corporate life, much like other rural Georgia towns, Swainsboro depended on railroads for transportation. However, in the 1930s, many of the town's streets and sidewalks were paved, and Swainsboro found itself at the intersection of two major national highways, U.S. 1 and U.S. 80, thus earning its city motto: "Crossroads of the Great South". U.S. 1 was the principal highway from Maine to Key West, and U.S. 80, at that time, ran from Tybee Island, Georgia, to San Diego. Swainsboro has a very active and thriving community of artists and art galleries, the most notable being the Kalmanson Art Gallery and Gallery Rfd. At the core is the Emanuel Arts Council, providing the area with arts and culture from many genres. The Emanuel County School District, run by the Emanuel County Board of Education, holds pre-school to grade twelve, and consists of three elementary schools, a middle school, a high school, and two academies. The district has 293 full-time teachers and over 4,664 students. Jack Durden, (1924-2013), World War II Purple Heart recipient and former POW, born in Twin City and later moved to Swainsboro before finally settling in Clayton County. 1 2 "Geographic Identifiers: 2010 Demographic Profile Data (G001): Swainsboro city, Georgia". American Factfinder. U.S. Census Bureau. Retrieved January 27, 2016. ↑ Georgia Board of Education, Retrieved June 8, 2010. ↑ East Georgia College, Retrieved June 8, 2010. ↑ Southeastern Technical College, Retrieved June 8, 2010.